I guess I’ll start by introducing myself a bit better and the reasons why I have created Tastefully Tash. My name is Tasha Meys, and I am 21 years old. I have just finished my degree forever so have finally taken the leap of faith to start this blog and launch myself into the real world. My degree is a Bachelor of Science majoring in Consumer Food Science and minoring in Marketing. I studied this at the University of Otago in NZ. This degree was awesome and helped me develop real skills to go with my passion for health food, recipe creation and wellness. This blog will be a platform of my evolving career (hopefully) in the health food and wellness industry, and where I will post all my new healthy (and simple) recipe creations. I started an Instagram for Tastefully Tash in about July this year and have been stoked with the following, support and inspiration I have already gained from it. I have been receiving lots of requests lately to explain my recipes and questions regarding whether I have a blog – so now I do! The first recipe I will post is the one behind these delightful little pancakes – featured in the photo above. These pancakes are my go to recipe when I get up in the mornings and am wanting something a bit exciting – ideal for a Saturday morning. Blend everything together, (mixture should be runny consistency), and pour into hot, coconut oil greased pan. Flip pancakes when there are bubbles forming on top of pancake and it feels like it has solidified. 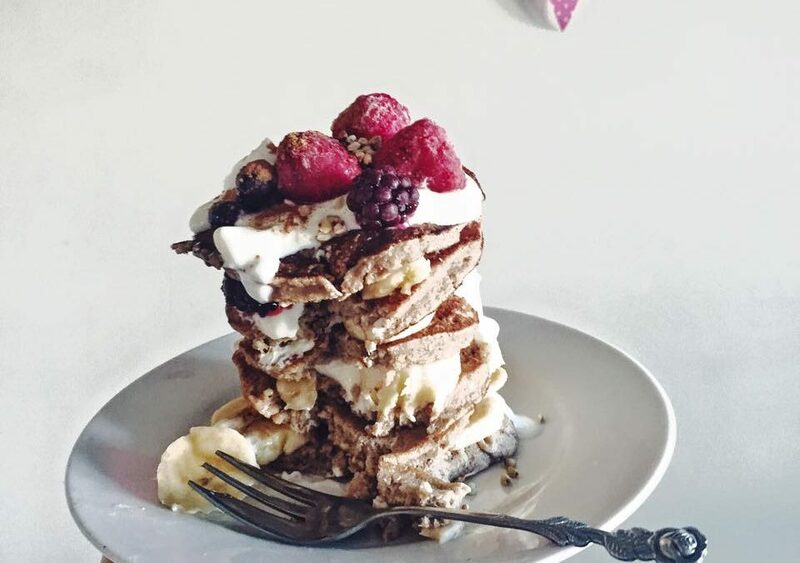 Layer on top of each other with bananas, yogurt and berries in between. You can add pure maple syrup or honey as desired. Hi 🙂 I have been loving your posts for a while now and just wanted to say that little rose handle fork is just the cutest! Really makes some of your photos! Keep up the beautiful stuff.